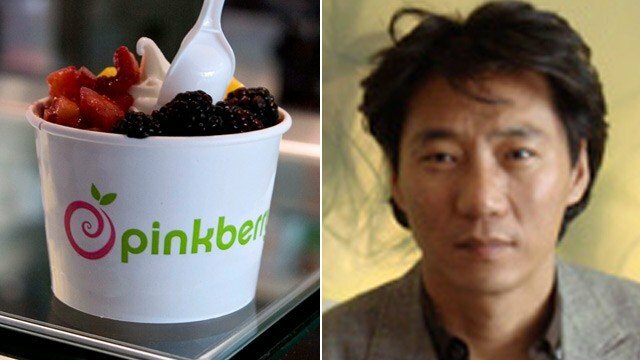 Young Lee, co-founder of the popular frozen yogurt chain Pinkberry, was convicted Friday of assault with a deadly weapon after confronting a homeless man he thought had disrespected his wife. Young Lee, 49, has been found guilty of beating a homeless man with a tire iron in Los Angeles. City News Service reports that Young Lee was convicted Friday of assault with a deadly weapon. Young Lee, who is no longer affiliated with Pinkberry, was taken into custody and is scheduled to be sentenced January 14, 2014. Prosecutors said Young Lee confronted the homeless man in June 2011 because Lee thought the transient had disrespected his wife by showing a tattoo. The homeless man was struck twice in the head and suffered a broken arm before witnesses stopped the attack.